During the cold season and outdoor events, it is imperative to keep warm. Towards this end, a wide variety of heaters, among them propane heaters, is available for sale in the market. Recently, propane heaters have gained a lot of popularity among homeowners. Their growing popularity is attributable to their portability and the fact that they are ideal for both indoor and outdoor use. As such, if you love camping, you can get yourself one of the best portable propane heaters to keep your tent warm whenever you are out in the woods. The only thing you need to note is that you have to place these heaters in areas that have good ventilation. Due to their need for ventilation, portable propane heaters are not particularly meant for indoor use, but you can use them to warm certain parts of your house. The heaters, however, are popular among many people because they are environmental-friendly, especially now that most people are conscious about avoiding pollution. This is because they use LPG, an eco-friendly fuel. 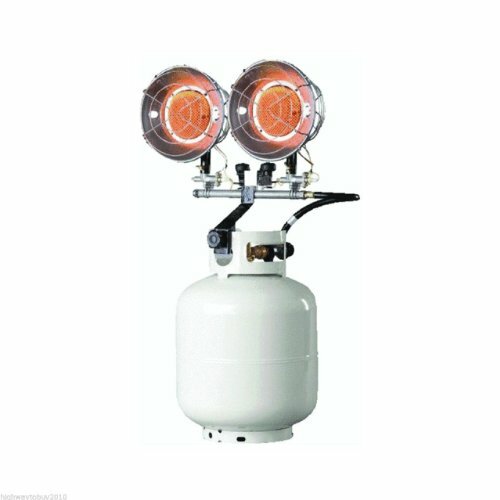 It is imperative to keep in mind that propane heaters cost more than natural gas, but they are quite efficient. In the long-run, however, they are more cost-effective than electric heaters. If you have an event in your backyard, a propane heater will easily provide the heat you want. It is, however, understandable that it may not be easy to select the right propane heater for your needs. To help you out, this article will comprehensively review ten of the best portable propane heaters that you could get yourself. It will also discuss the factors that you need to consider before purchasing any propane heater to ensure you find a heater that meets or exceeds your heating needs. Before you purchase any product, there are some things that you have to look out for. The same standards apply when you intend to purchase a portable propane heater. Here are some of the features you should look out for in a portable propane heater. When you turn the propane on, there has to be a way of igniting the fuel in order to produce heat when the propane burns. Usually, propane heaters come with either an integrated ignition system or a manual ignition system. The former only requires you to turn on the heater and the fuel is automatically ignited while the latter requires you to ignite the fuel manually. A propane heater with an integrated ignition is preferable because it is safer and more convenient to use. The safety features on your heater are a major consideration. This is because propane is a flammable fuel and using a propane heater poses some type of risk. If the propane heater malfunctions, it may be a hazard. As a result, you need to ensure that the heater you buy has inbuilt safety features. Most portable propane heaters include an anti-tip-over switch. This feature automatically switches off the heater if it is tipped over and prevents fire incidences. Ensure to get a heater that has an overheat protection and thermostat; these features ensure the heater automatically switches itself off in case it overheats. Moreover, confirm that the heater is meant for indoor or outdoor use or both. Using a heater that is not meant for indoor use in your home may be dangerous. When you are getting yourself a propane heater, ensure that it is portable to allow you to move it from one position/location to the next. Go for a heater that is designed with carrying handles to allow easier movement. Alternatively, you could go for one of those heaters that include castors or wheels that make moving them around an easy task. When you are buying a portable propane heater, it is imperative to consider the location you intend to use it on. 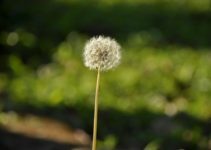 If you want to use it on your lawn, ensure that you get one that is specified for outdoor use. 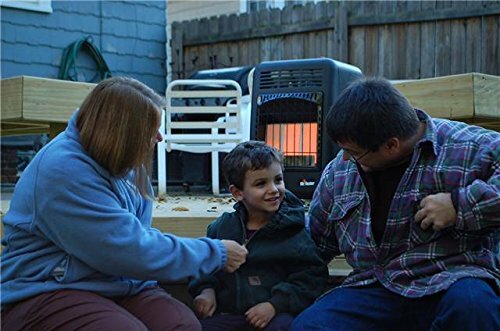 A heater designed for outdoor use is able to spread heat over a wide area. If you intend to get one for heating your room, get one that is designed for indoor use for optimum safety. Never use an outdoor heater in a closed room or tent. Before you settle on a heater, make sure that its price is within your budget limits. Remember that quality is not always defined by price. Be sure to assess the cost of each propane heater against its features and then go for the one that matches value with price. One of the most important aspects of a portable propane heater is its heat output capacity. As such, you should buy a heater whose BTU rating is able to cover the area you want to heat. If you intend to heat your patio or another outdoor area, get a heater with a high heating capacity. Portable propane heaters are common today, and they have a couple of advantages. Here are the most notable ones. One major advantage of propane heaters is safety. They are designed with features such as the anti-tip over switch that helps to prevent fire outbreaks. Others also include sensors that help them to automatically shut down when they overheat or when the oxygen levels are too low. Compared to conventional heaters, portable propane heaters use less energy. 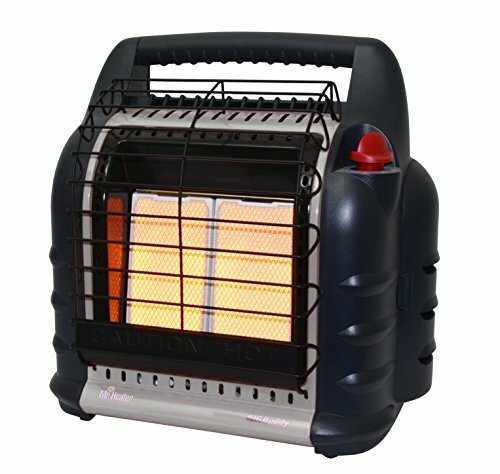 If you are out camping, it would be ideal to have with you a portable heater as compared to lighting firewood. Moreover, some come fitted with fans that enhance heat distribution. 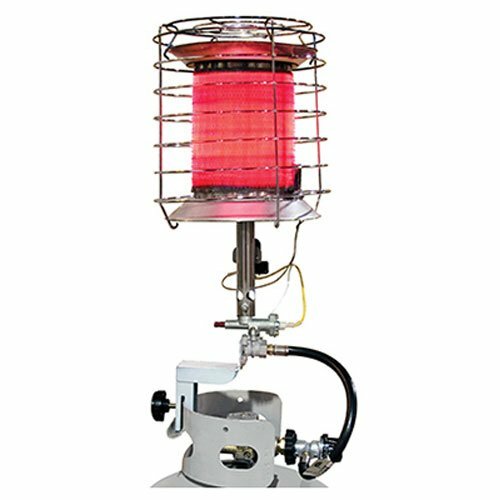 Portable propane heaters are compact and require minimal to no maintenance. Environmental conservation is trend nowadays, and the less an equipment contributes to environmental pollution the better. Propane heaters use LPG, which is considered an eco-friendly fuel. In addition to using an eco-friendly fuel, portable propane heaters run without making any noise primarily because they do not have any moving parts. If you are looking for a propane heater to help warm the next party you hold on your lawn, you can rely on the RMC-LPC80DG because it can heat up to 2,000 square feet. It also has a BTU rating of between 50,000 and 80,000. It is an ideal heater for both outdoor and indoor environments, but you will need proper ventilation to use it indoors. Your safety is guaranteed using this heater because it includes an auto-safety shut-off and a large base to enhance stability. Moreover, it distributes heat evenly at a 360◦ radius. • It is easy to ignite. • The heater has an excellent BTU rating. • The heater is not very durable. • It is also quite loud. If you are looking for an energy-efficient device to warm your house during the cold season, you might want to try out the RA18LPDG. With its ergonomic design, this propane heater includes locking casters to enhance portability from one room to the next. In order to run, it requires a 20-1b propane tank, which you have to purchase separately. Interestingly, you can set it to deliver the warmth you want using the adjustable heat settings. It also has an inbuilt oxygen depletion shutoff for safety purposes. • It is suitable for indoor and outdoor use. • The heater burns for a long time. • It has piezo ignition. • The heater is too heavy for some users. • The pilot does not stay lit. • It is not as durable as rival products. 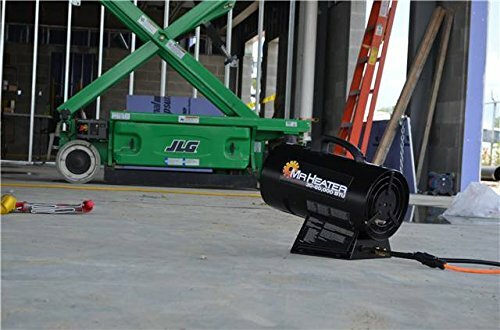 This efficient portable propane heater has a 4,000 – 9,000 BTU, which makes it ideal for indoor use. It supplies heat up to 225 sq. ft. and is eco-friendly. For efficient operation, however, you should use it at altitudes below 7,000 ft. Besides being eco-friendly, the heater is exceptionally safe considering it automatically shuts-off in case it tips over, identifies low oxygen levels, or if the pilot light goes out. It also includes a fold-down handle to optimize output. • It is reliable and stable. • This heater is ideal for indoor use. • It includes a piezo ignition. • The BTU is relatively low. • The pilot light takes time to turn on. Mr. Heater has once again outdone themselves with the MH60QFAV. The heater uses QBT technology, a feature that makes it quieter compared to other standard propane heaters. The heater’s design also features a steady base to optimize its stability and safety. With a 60,000 BTU, the MH60QFAV has excellent heat output capacity. When you place it on low settings, it can run up to 14 hours using a 20 lb. tank. With continuous ignition, this device supplies heat up to 1,500 square feet. • It has a rugged and durable construction. • The heater is compact and portable. • The heater is noisy. 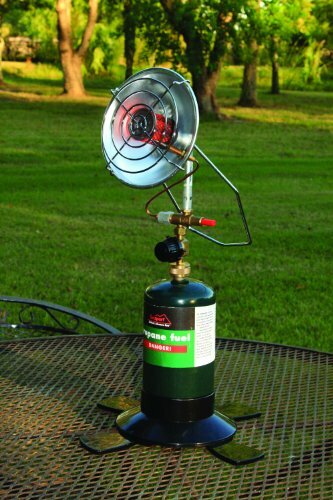 If you are going camping in the cold weather, you might want to accessorize with this portable propane heater. Texsport has a sturdy stainless steel burner, which is very durable. It also includes a plastic stand that enhances its stability. The portable heater relies on standard size 1 lb. disposable propane tanks, making it ideal for your camping trips. For maximum safety, it has a valve that shuts off fuel supply in case the flame goes out. • When on low settings, it can run all night. • The heater is lightweight. • It is ideal for camping. • Its price is fair. • It is a bit loud. If you are looking for a high-quality heater for your outdoor needs, you might want to consider MH18CH Radiant Cabinet LP from Mr. Heater. This device has a sturdy and durable construction made of steel. Moreover, it has an ergonomic design with carrying handles and castors for easy portability. What’s more, MH18CH can run for 24 hours on maximum BTU and 72 hours on minimum BTU. By any standards, this is quite impressive. The device also comes fitted with a hi-med-low regulator and an automatic low oxygen shutoff system that enhances its safety. • The heater has a sturdy construction. • The heater has an impressive run time. • The pilot light does not stay lit after some time of use. • It is in the higher price range. If you are looking for an efficient propane heater that you can use both indoor and outdoor, you might want to consider F274830 MH18BRV. This heater supplies heat up to 300 sq. ft. with an output capacity of 4000 to 18,000 BTU. 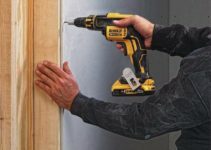 It includes all the safety features you would desire in a propane heater such as a low oxygen shutoff system and an anti-tip-over switch. When using this heater, ensure you are at an altitude that is below 7,000 ft. It also has a hi-mid-low control knob that allows you to adjust the heat output to your preferred levels. • It has a fair price for its value. • It is easy to operate. • The heater is safe and efficient. • The pilot light not the best. If you have been looking for an outdoor heating equipment for your night endeavors, you might want to consider Dura Heat TT-360, a device designed to transfer heat at a 360◦ radius. 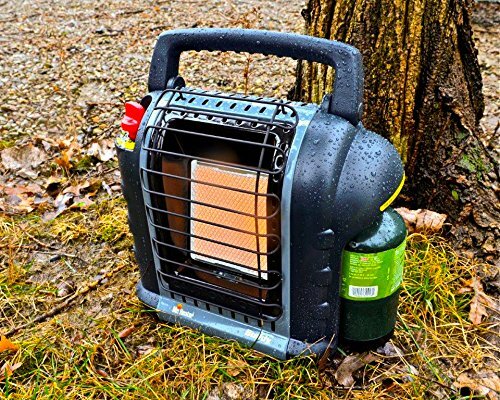 Designed for outdoor use, the heater is easy to connect to the 20-pound tank, and it can run up to 14 hours. One of its most impressive features is the CSA approved mercury anti-tip-over shutoff. 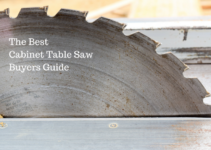 What’s more, it has a rust-resistant chrome emitter guard and a stainless steel heat reflector. This heater, however, requires a match to ignite. • It is safe to use. • It produces enough warmth. • The heater comes with a sturdy construction. • It is easy to assemble. • It is only suitable for outdoors use. • Its instructions are not accurate. The MHIT is a suitable heating equipment that you may want to go with in your camping trip or use within your premises. This heater features a sturdy construction, which enhances its durability. You also don’t have to worry about it being noisy at night as it functions smoothly. Interestingly, the MH15T includes a 1-year warranty, and it heats up the place well. • The heater is portable. • It is economically priced. • The heater guarantees efficient heating. • It is not very durable. 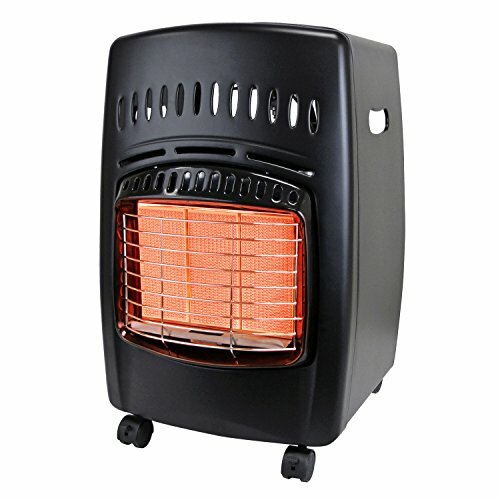 heater is made of metal, making it exceptionally durable. It also includes two tank tops for better distribution of heat. For its price, this heater delivers excellent performance and has a 1-year warranty. Another cool detail about this propane heater is its quiet operation. • It has a strong construction. • It has an excellent heat output. • The heater is lightweight and easily portable. • It is easy to set up. • It requires you to light it from the side or be burnt.